Readers, I took my mum on an adventure last week for afternoon tea at the Glasgow institution which is the Willow Tea Rooms. They have two sites in the city centre – one on Buchanan Street (enjoyed by the tourists) and one within Watt Brothers on Sauchiehall Street. This time, I took my mum with me on my latest Glasgow food blogger adventure. We visited the Buchanan Street Tearoom and were seated upstairs in the Chinese tearoom – painted blue. 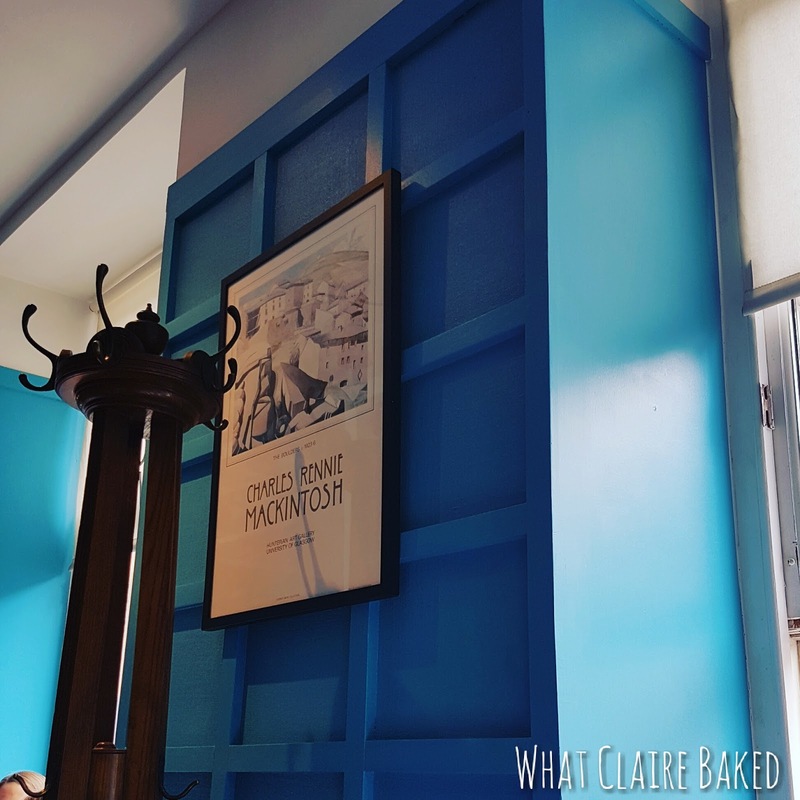 Go up the stairs and you’re treated to a two level tearoom, with Rennie Mackintosh inspired furniture and his signature style dotted throughout the venue. It’s incredibly traditional and charming, with the waitresses dressed in black dresses and white aprons. We went for the afternoon tea at £12.95 per person – which visitors flock far and wide for. 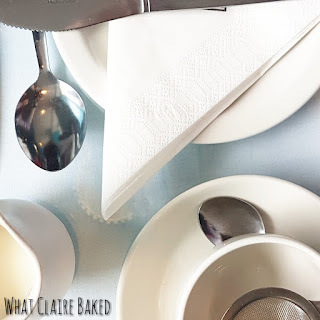 You start by choosing your tea from the vast selection of loose leaf (I went for the Cranston blend), then pick your choice of cake from the cabinet. But more about the giant strawberry tarts later. Our afternoon tea arrived shortly after, served on a traditional three tier display with finger sandwiches on the bottom. Top marks to our lovely waitress who shared the selection of sandwiches with us when we ordered and allowed us to make a few swaps (we’re not a family of egg mayo lovers). They were cut into dainty finger shapes, crusts removed and on fresh, soft bread. Next level up, our cream scones were waiting – a choice of plain or fruit – with traditional clotted cream and jam. A little shortbread round was also on the plate, to enjoy with our tea. After much debate on the cream versus jam, which goes first on a scone, we tucked in. Let it be known that you’ll get proper home baking at Willow Tea Rooms. There’s no “bought in” cakes here. 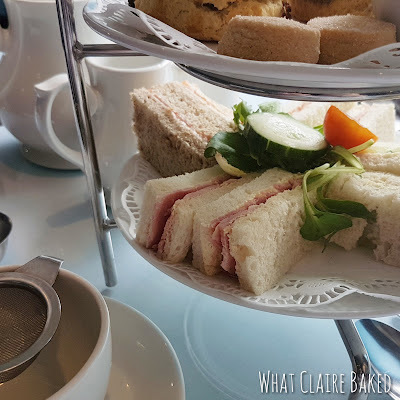 It’s a real bugbear of mine when you go for an afternoon tea and are presented with untidy sandwiches and frozen cakes (I’ve been somewhere before, where there was definitely ice in the middle). Not here though, the scones were home-made. 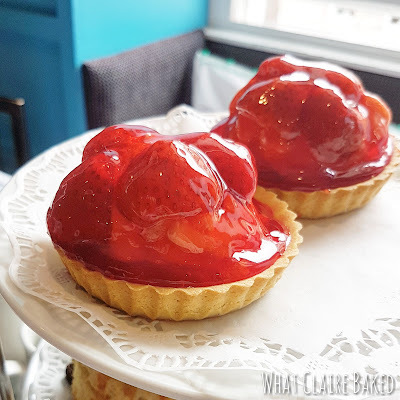 Back to the strawberry tarts. These things were HUGE. We’re talking several strawberries, big dollops of cream, delicious short pastry and loads of strawberry tart jelly which I love. They easily filled the top level of the cake stand and were worth waiting for. I always feel a summer isn’t complete without the arrival of a Strawberry tart (favoured around Wimbledon season, just in case you are wondering!) For me, these were the highlight of the afternoon tea. Mum and I both enjoyed our visit to this Glasgow institution – a favourite with both locals and visitors to the city. You’ll find Willow Tea Rooms Buchanan Street at Number 97 – towards the lower end of Buchanan Street - for people who are new to Glasgow. Head up the stairs and you’ll be greeted by friendly waitresses showing you with a table. Be prepared for a short wait if you haven’t pre-booked, especially during peak times in the day. And don't forget to try the strawberry tarts! For more information, keep up to date with Willow Tea Rooms on Facebook, Twitter and Instagram. 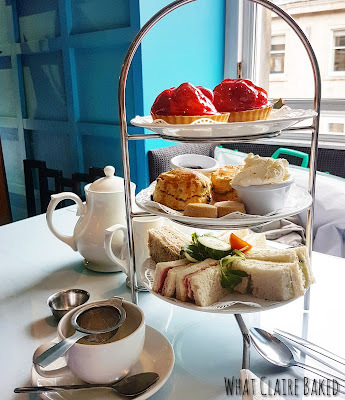 Disclaimer: I was invited along to Willow Tea Rooms as a Glasgow Blogger to try their afternoon tea menu in exchange for a write up. Any opinions expressed are my own.